Lady Datejust vs Lady Date - What's The Difference? Although Rolex is sometimes thought of as making watches primarily for a male audience, they have long had a strong women’s range as well. Chief among them has traditionally been the Lady-Datejust released in 1957, a 26mm version of the iconic men’s piece that had been around for a little over a decade by then. True to their overriding dedication to utmost quality, there has never been any distinction between the men’s and women’s watches other than size. The reliability, performance, craftsmanship and attention to detail are consistent across both. Unlike the men’s Datejust though, which lost its flagship status to the Day-Date in the mid-fifties, the ladies version is still at the pinnacle of the women’s range. Over the 60 years it has been in existence, the Lady-Datejust has been issued in a range of styles almost as exhaustive as the original. Available in three flavors of gold, as well as two-tone Rolesor and ultra precious platinum, it can be had on any of Rolex’s trio of metal bracelets; the Oyster, President and Jubilee, and with all manner of gemstone enhancements. However, as with the men’s series, there was also an entirely stainless steel iteration of the Lady-Datejust, known simply as the Lady-Date. 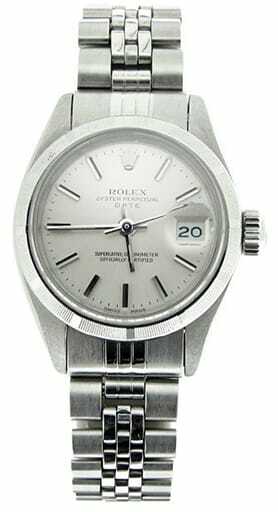 While there is, as well, an all steel men’s Date watch to sit alongside the comprehensive Datejust range, the two differed slightly in size; the Date coming in at the marginally smaller 34mm to the Datejust’s 36mm. With the Lady-Date and Lady-Datejust series, both were originally the same size, at 26mm. The only difference between the two is the metals used in their construction. You won’t find any gold or platinum Lady-Dates, nor any diamonds on the bezels or hour markers. The exclusive use of Rolex’s typically flawless steel gave the watch a little more of an under-the-radar vibe, and it was only fitted with an Oyster or Jubilee bracelet, not the President. If you wanted to be even more confused, there were also 26mm Lady-Datejusts in steel, but they were topped with a white gold bezel. The Lady-Datejust and the Lady-Date have always been subjected to Rolex’s ever-present search for perfection, with the same countless upgrades exacted on both over the decades. 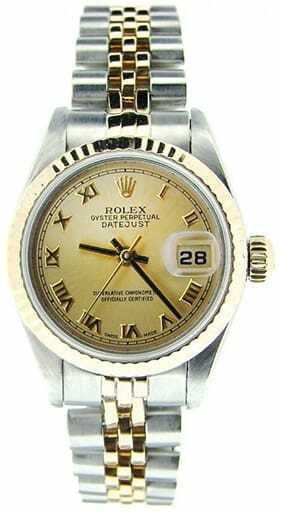 The Lady-Date, perennially in the Datejust’s shadow, usually got its improvements a few years later than its big sister. So, they each benefitted from the brand’s advancements in caliber technology, in terms of both accuracy and convenience. Incidentally, some believe that the difference in the watch’s names stems from the Lady-Datejust having a Quickset date feature, while the Lady-Date doesn’t. That is not entirely true. Quickset is the name given to the function that allows the wearer to advance the date independently using the crown, rather than having to spin the hands through 24 hours. Both series received movements equipped with a Quickset mechanism, but the Lady-Datejust got it first. On the vintage market, you will find examples of both watches with and without the feature. In Rolex’s contemporary lineup, the smallest Lady-Datejust is now 28mm. The last 26mm model was retired in 2016. The smallest, and only, Date watch comes in at 34mm, a midsize that overlaps onto both the men’s and ladies range. The trend for larger watches for women is just as noticeable as it is with the men’s, and the Datejust, which now comes in four different sizes, is finding itself on more female wrists than ever before. After their many years as the archetypal luxury watches, with a timeless styling that transcends fashion, they are still the go-to for sophisticated women from every walk of life.